The Georgia Department of Transportation, along with a group of community partners, were recently recognized for the trail by the American Association of State Highway Transportation Officials (AASHTO) with a top award in the America’s Transportation Awards competition. 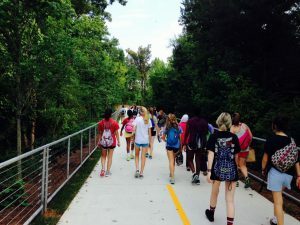 Bringing the trail to fruition was a collaborative effort; the list of community partners includes the City of Atlanta, MARTA, the Path Foundation, Buckhead Community Improvement District, Livable Buckhead, and Trees Atlanta. Path400 will ultimately be a part of a greater trail network within the neighborhood, which will connect schools, parks, and residential areas to the urban center of Buckhead. Several new park projects are in the works along Path400, including Park over GA400, and a planned park which is to be constructed on the site of a former school and family cemetery. The community around Path400 is actively programming the newly created urban green space, with ‘Biketober’ events, temporary art projects, wildlife habitat development and tree planting activities, as well as guided trail tours. When finished, Path400 will connect to the larger Atlanta BeltLine Trail, linking travelers to the BeltLine’s 33+ mile network of trails and the region’s expanding public transit system. Future plans include extending Path400 further north, and adding an east/west link to Interstate 285 as a part of the much larger Transform 285/400 improvement project. This extension will eventually connect trails in Roswell and Alpharetta into the Buckhead segment of Path400 and, ultimately, to the BeltLine. Accessible green space, connected pedestrian networks, and well-integrated transit service are all ingredients for a healthier, more walk friendly community. By continuing to advance high quality multi-use trail projects within their city, Atlanta is positioning themselves to have a truly remarkable future pedestrian transportation network.